The Law Offices of Leah V. Durant, PLLC specializes in vaccine litigation cases brought under the National Vaccine Injury Compensation Program (NVICP). Our firm advocates exclusively for the innocent children and adults injured by common vaccines. 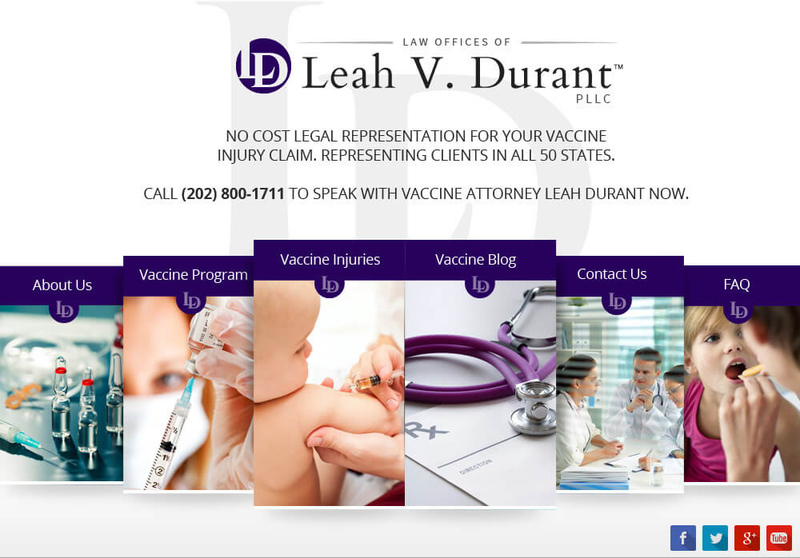 The Law Offices of Leah V. Durant, PLLC represents children and adults who suffer from vaccine related side effects or vaccine injury and are eligible to receive compensation under the National Vaccine Injury Compensation Program. Although our office is located in Washington, DC just steps from the US Court of Federal Claims, or "Vaccine Court," because the NVICP is a national injury compensation program the Law Office of Leah V. Durant serves clients in all 50 states and U.S. territories. The Court and your attorney will travel to a hearing in your area at no financial cost to you. Our legal representation comes at little or no financial cost to you. Have you or someone close to you been injured by a vaccine? Significant awards of compensation may be available. Contact us today to learn if a remedy exists for you. Seeking compensation is a complex process. The Law Offices of Leah V. Durant will guide you through the necessary steps to ensure that you receive the highest award possible. Your compensation will be yours to keep. We take no contingency fees. On October 1, 1988, The National Vaccine Injury Compensation Program was created by Congress as a no-fault alternative to the traditional tort system for resolving vaccine injury claims. The NVICP provides compensation to people found to be injured by vaccines. The law requires that claims for vaccine injuries be processed in the Vaccine Program prior to the filing of any civil lawsuit. Because this is different than typical medical malpractice or personal injury claim, only an experienced vaccine lawyer like Leah Durant is qualified to handle your case. What is the Cost of Hiring a Vaccine Lawyer? Once our vaccine lawyer has reviewed your case and determined that it meets these standards of good faith and reasonable basis your vaccine case will be filed with the Court and you are not responsible for any legal fees. Many individuals who suffer an adverse reaction to a vaccine are unable to pay the legal costs of filing and maintaining a lawsuit. The vaccine lawyers at the Law Offices of Leah V. Durant, PLLC, will pay the costs of litigating your case including expert witness fees, costs associated with obtaining medical records, and most other costs associated with litigating a vaccine injury claim. At the conclusion of your case our vaccine lawyer will seek repayment of those costs from the vaccine court, also known as the Court of Federal Claims. How Do I File a Vaccine Injury Claim? Instead of filing a vaccine injury claim against vaccine manufacturers or your doctor, a person injured by a vaccine must file his or her case in the U.S. Court of Federal Claims (located in Washington, DC). Each case is defended by the Secretary of Health and Human Services (the defendant or respondent), who is represented by highly specialized vaccine attorneys whose sole job is to handle vaccine related claims at the United States Department of Justice. To prove causation, the Vaccine Act provides a burden-shifting device known as the Vaccine Injury Table. Individuals who have suffered vaccine injuries according to criteria listed in the Vaccine Injury Table make out a legal case for compensation that the Secretary of Health and Human Services may rebut by proving that the proposed vaccine injury was caused by “factors unrelated” to the vaccine. 42 U.S.C.§§ 300aa-11(c)(1)(C)(i),300aa-13(a)(1)(B). If an individual who has filed a vaccine injury claim does not meet the criteria outlined in the Vaccine Table, he or she may still receive compensation by proving that the proposed vaccine injury was actually caused by a covered vaccination. 42 U.S.C. §300aa-11(c)(1)(C)(ii). Under current case law, to establish a legal case for actual causation of a vaccine injury, an individual filing a claim must show by a preponderance of the evidence that the vaccine brought about the injury by providing: (1) a medical theory causally connecting the vaccine and the injury; (2) a logical sequence of cause and effect showing that the vaccine was the reason for the injury; and (3) a showing of a proximate temporal relationship between vaccine and injury. Compensation awarded under the Vaccine Act is paid from the Vaccine Injury Compensation Trust Fund, financed by an excise tax on vaccines. If you believe you have a claim due to side effects from a vaccine or suffer from a vaccine injury, please contact the vaccine attorneys at the Law Offices of Leah V. Durant, PLLC. Complete our online form or give us a call today to schedule a free consultation.